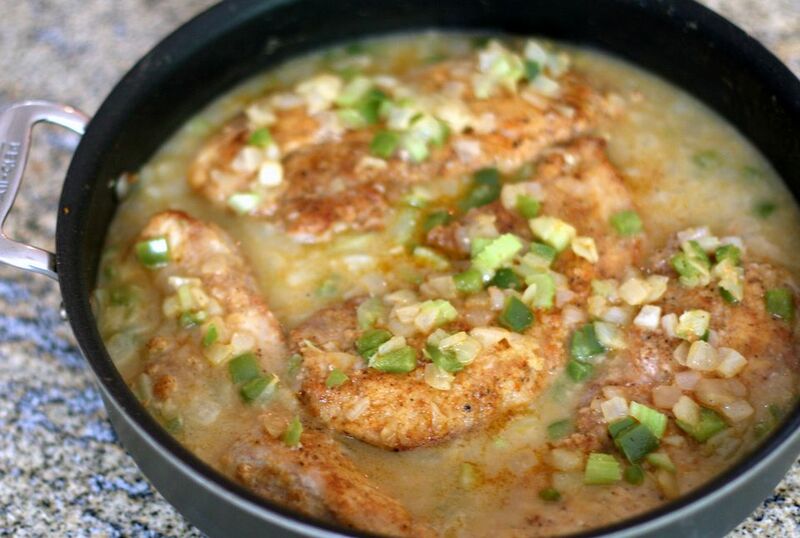 These smothered pork chops make a tasty family meal. It's a quick and easy preparation, perfect for a busy day. The pork chops are seared and then simmered with chicken broth and Cajun-style chopped vegetables and seasonings. Use boneless or bone-in loin pork chops in the recipe. Serve these tasty pork chops with potatoes or macaroni and cheese for a fabulous everyday family dinner. Combine 3 tablespoons of flour and the Cajun seasoning. Coat the pork chops thoroughly with the seasoned flour. When the oil is hot, add the pork chops to the skillet—Cook for about 4 to 5 minutes on each side, or until nicely browned. Remove the chops to a plate and add the butter to the skillet. Add onion, green pepper, and celery and cook, stirring, until the onion is softened. Stir in the remaining 1 1/2 tablespoons of flour. Cook, stirring, for 2 minutes longer. Add the chicken broth and Worcestershire sauce to the skillet. Add the pork chops, cover, and reduce heat to low. Simmer for 20 to 25 minutes, or until the pork is tender. Expert Tip: If you are using pork shoulder chops, add 15 to 25 minutes to the braising time.